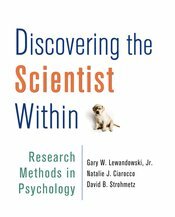 In this breakthrough first edition, authors Gary Lewandowski, Natalie Ciarocco, and David Strohmetz draw on their extensive classroom experiences to introduce research methodology in a highly effective, thoroughly engaging new way, maximizing students’ familiarity with every step of the process. For the first time in a methods text, each design chapter follows a single study from ideation to writing for publication, with students researching an intriguing question emerging from a chapter-long case study. Also for the first time in a methods text, each design chapter models the entire research process, so students get multiple opportunities to experience that process start to finish.